A window air conditioner is a unit that sits in your window space and cools an area in your home. With some window air conditioners, you can also mount them to your wall. The ultimate goal of any air conditioner is to cool your home or space down. They usually come with a remote and offer a range of settings to suit your needs. Before you buy an air conditioner online, take the time to view the pros and cons of the available options. Doing your homework can save the hassle of having to return a cumbersome window air conditioner via the post. If you don’t mind a little “white noise” going on in the background, then there’s every reason to consider purchasing this window air conditioner from Koldfront. It’s affordable, effortless to install by a professional, and comes packed up tightly so that it’s safe and ready to roll once you take it out of the box. There’s no denying this window air conditioner is loud to the point of annoying, but how that affects you can depend on where you place it. What’s more, its other features can ensure it’s not a problem. It has a 24-hour timer, an alert to tell you when to change the filter, and it even comes with an Energy Star rating. Therefore, your power bill won’t look too unhealthy after running the air con during the summer. It also has plenty of settings to play with, such as automatic, sleep, dry, and three fan speeds. The cooling capacity of this air conditioner will impress too, offering 10,000 BTU and a temp range of 62-86 degrees-Fahrenheit. Sealing the deal is the remote control, which makes altering settings far quicker. Take note and consider this air conditioning unit today. Being comfortable in your home is what everyone aspires to be, but in the heart of summer or winter, you might quickly discover that’s not possible without a new window air conditioner. Fortunately, Koldfront comes to the party with a compact heating and cooling unit you can install in your window or even on your walls. 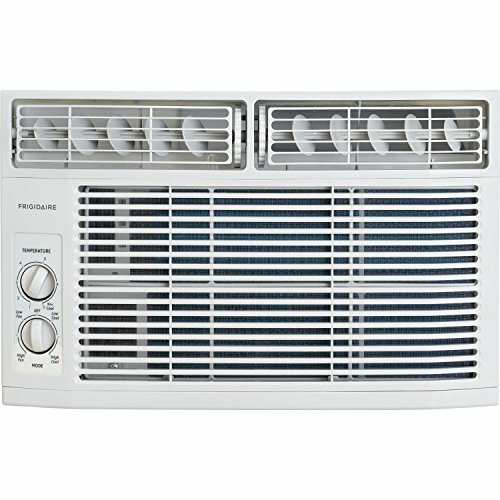 It has a 12,000 BTU cooling capacity, is suitable for heating, and offers four operating modes for your convenience too. If that’s not enough to convince you of its efficacy, then the addition of the remote might be. You can control all operations from one simple remote, ensuring your comfort even if you’re not sitting by the window air conditioner. What will also impress is how little effort it takes to install it. You can hire an expert or do it yourself, and the air conditioning unit comes with all the weather seals and hardware you need to do the job. It will take care of an area up to 550 square feet and has four-way directional louvers to push the heat or cold air out. Even though it’s noisy and quality control for some people was dismal, you may find this is the perfect window air conditioner for you. 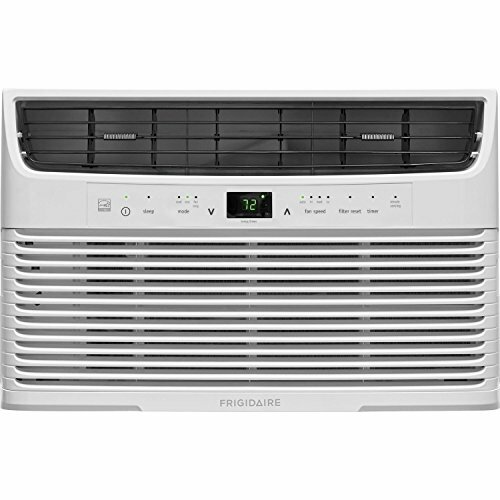 Trying to find a window air conditioner that’s packed full of features with an affordable price tag is not easy, but thanks to Frigidaire, it’s not impossible. If you would prefer to have a unit that would heat and cool instead of one or the other, then this could be the window air conditioner for you. Not only does it keep you fresh during the intense heat of summer, but it will also help you remain toasty and warm in winter too. You can install it on your window with the window mounting kit, or attach it to your wall. It also comes with a slide-out chassis, a unique feature that other window air conditioners may not offer. There are also several other features that are bound to impress. You get the joy of using multi-speed controls, a remote control, and a timer you can set for 24 hours. It’s also capable of heating or cooling a 350 square-foot space with its 8,000 BTU cooling and 7,000 BTU heating capacity. 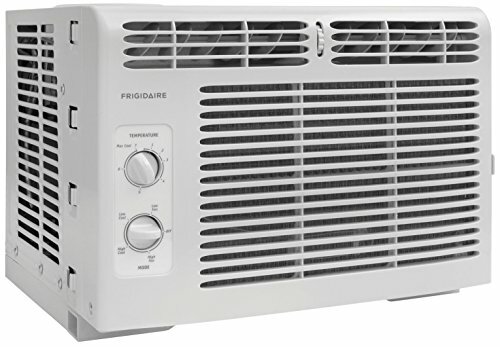 It’s a bit loud, the settings on the unit are hard to see, and the heating functionality could be better, but if you need something robust and made to last – and you need it now – then take a closer look at this window air conditioner from Frigidaire. When the temperatures are sky-rocketing in your small home, and you need a solution quickly, then consider this simple window air conditioner from hOmeLabs. While you wouldn’t use it to cool a big space, and it’s by no means technologically advanced, it’s an excellent and affordable option for those who are seeking a no-frills approach to home cooling. It offers a cooling capacity of 5,000 BTU and cools down a 150 square-foot space. It also comes with all hardware to install it yourself, as well as detailed instructions. Alternatively, you can call experts for help with the process. Once you install it, you can immediately reap the rewards of cooler space. It comes with seven temperature settings, two-way air direction control, and a thermostat that lets you adjust to high or low. However, it’s important to know that the thermostat can be quite touchy and you have to turn it off and on manually. Other units are often automatic. There is a lot to love about this window air conditioner – even down to how you maintain it. You don’t have to worry about expensive single-use filters. The one inside this window air conditioner is reusable. Clean it then put it back in; it’s that easy. Even though this unit has no frills and is simplistic from top to toe, it’s desirable for that reason. 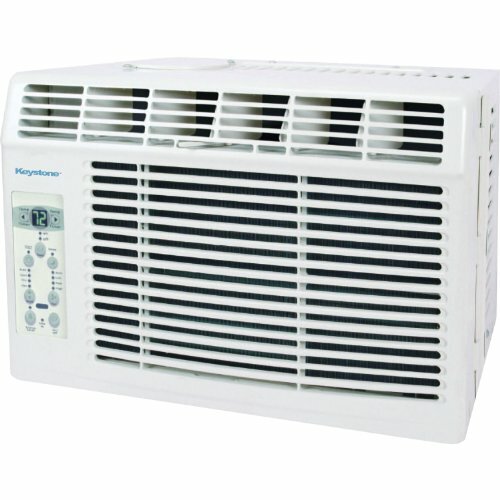 Get out of the intense summer sun by purchasing this window air conditioner today. Even though you would only buy this window air conditioner if you want to cool a small space, it’s worth every penny to do that. It’s packed full of features that will see you fresh and happy throughout the sweltering months of summer. When you buy this window-mountable window air conditioner, you get all the hardware and installation instructions you need. Therefore, the process for installing it is rather easy. 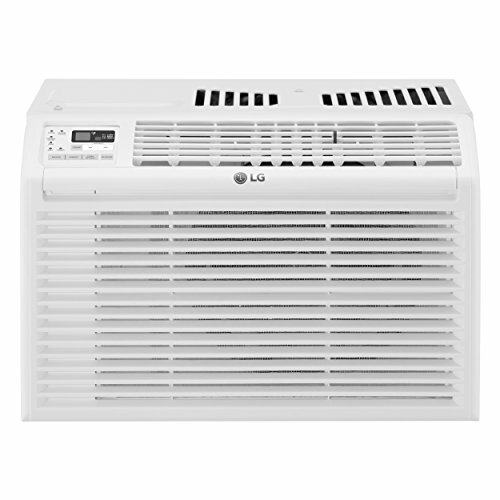 It also weighs 47 pounds, comes with a remote, and will pump out 5,000 BTU to keep your small room fresh and cold. This ADA-compliant window air conditioner is also conveniently accessible to use. All the settings are on the front of it, but the remote lets you make alterations as well. Sealing the deal is the one-year warranty and five-year sealed system warranty. There are many reasons why you would buy this air conditioner and very few why you wouldn’t. 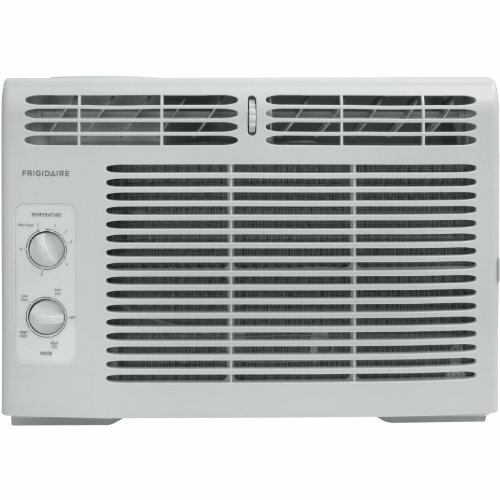 If you don’t think your family will make it through another summer in the sweltering heat, then it’s time to purchase this Frigidaire window air conditioner before the warmer weather hits again. Once you feel the cooling breeze of this unit, you’ll never want to be without it. As an air conditioning unit that’s suitable for families, it’s capable of cooling a space up to 450 square feet while pumping out 10,000 BTU of fresh air. While it’s doing that, it’s able to take care of three pints per hour of dehumidification. This ADA-compliant unit is also easy on the power with its Energy Star rating, runs on your standard electrical outlet, and comes with a range of settings on the included remote to keep your family happy. As soon as the sun comes out, you’ll be able to remain comfortable and cold inside. It’s quite challenging to install, has a high risk of damage in shipping, and is loud when you run it on a high setting, but given that it comes with a one-year warranty and a five-year sealed system warranty, there’s every reason to give it a chance. Add it to your wish list today. 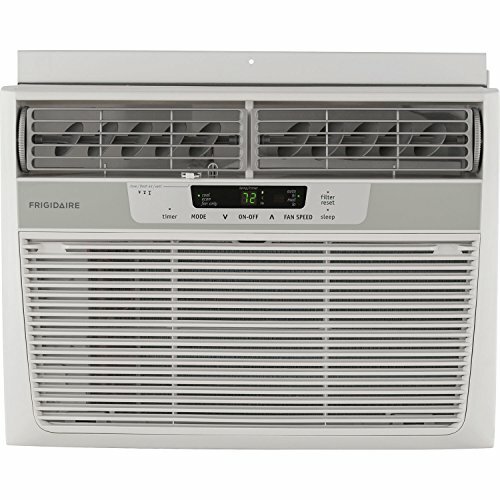 If you don’t mind not having any automatic settings on a window air conditioner, which means you have to do everything yourself, then check out this model from Frigidaire. With a no-frills design, it’s the perfect option for those who don’t understand or want to learn about automatic sensors, settings, and all the bells and whistles. It’s a simple, straightforward, and effective window air conditioner that will suit most small houses or apartments well. It lets out 8,000 BTU of cold air, runs on your standard 115-volt electrical wall socket, and will be suitable for up to 350 square feet of space. That’s not all this window air conditioner has to offer either. Its dehumidification properties are second to none, with 1.7 pints per hour, and it provides three cooling and fan speeds too. Its eight-way air direction also ensures that every area of your room benefits from cold air during the sweltering heat of summer. It’s also effortless to install and, even though it’s loud, will be a welcome addition to any stuffy home in need of sweet relief. While you wouldn’t use this window air conditioner in your bedroom due to how noisy it is, you would happily operate it in a living room or any other part of your home. It’s sleek, stylish, affordable, and, most importantly, provides cold and refreshing air. This window air conditioner is leagues ahead of its competition for several reasons. The first is the BTU range. If you know you need a particular output, this unit delivers. It has eight BTU outputs to ensure you get the best cooling capacity possible. You can also buy it with or without the extension cord to power it. The designer white color scheme coupled with the 250 square-foot cooling capacity is a recipe success. It won’t look out of place in your home, but will still cool a generously sized area with 200 cubic feet of air circulation every minute. It also has a 24-hour timer, on and off settings, and an Energy Star rating that won’t see you panicking about your power bill. What’s more, it doesn’t take a rocket scientist to install this unit in the window, and it comes with all the hardware you to need to do it. Its noise might let it down, but overall, this window air conditioner is one that will feature near the top of your “must have” list. Aside from having a higher price tag than other window air conditioners on the market, this one is well worth a closer look. When you line it up with other air conditioning units on the market, you will see it’s far ahead of many other brands. When you struggle with the intense heat during the summer months, then it’s time to buy an air conditioning unit that will blow your socks off – and this one will. Its cooling capacity is 12,000 BTU – far more than others on the market. As a result, it’s suitable for almost any home. Alongside this incredible cooling capacity, it still has a premium star rating so that it doesn’t have an impact on your power bill. It will also cool your home that effectively that even in the heart of summer, you may need to put on a coat! That’s not all that will have you purchasing this window air conditioner either. The remote offers full use of settings and functionality, so you don’t have to walk up to the unit itself. It has electronic touch controls, an adjustable thermostat control, and even a timer and clock function. Set it to sleep mode, set it so it comes on before you get home from work, and work with the three cooling options and three fan speeds. Even when it comes to maintenance, this window air conditioner has other brands in a chokehold. You can remove and wash the filter with no hassles, put it back in, and have it operating at its best again. It works quietly, efficiently, and looks sleek and stylish too. 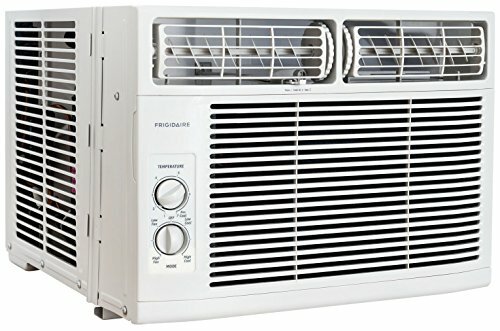 This window air conditioner may not be the most affordable option, but regarding features and quality, it’s at the pointy end of models you should buy. If you decide to buy a window air conditioner online, then you’re making a brave decision. The weight and loft of such an item can mean that you have one chance to get it right – otherwise, the return process will be a nightmare. If the thought of choosing the wrong air conditioning unit and having to send it back keeps you up at night, then it could be time to do your homework. Reduce your risk of making a poor purchasing decision by considering the following criteria. The first and most important thing to consider is the cooling output. If you don’t think about it and only look at the price tag, there’s a high chance you can buy one that doesn’t cool your property effectively. Every window air conditioner is different – with various square-foot and BTU outputs to suit different spaces. Think about where you’re going to put it, then match the square-foot capacity of the one you like to that space. When you’re in the market for a new window air conditioner, you want it to cool your house. But what about warming? Some do both. The two-in-one convenience can be worth the additional cost, so weigh up whether you may need to heat and cool your home, or only cool it down. The settings can differ dramatically from one air conditioner to the next. Some are automatic and require minimal adjustment, while others are fully manual. If you like the convenience of “set and forget” then choose a more advanced, automatic model. How DIY savvy are you? By choosing a window air conditioner, you are going to have to install it into your window with weather sealing and plenty of muscle power. If there is an option for an installation expert to help, then pay the extra. The task can be mammoth for one person – or one that doesn’t know what they’re doing.